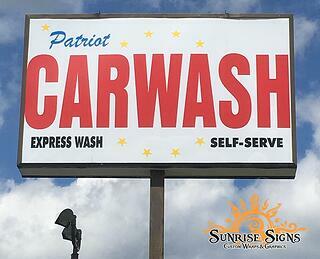 Located at 1321 Crescent Boulevard, the Patriot Car Wash is a business that offers motorists the opportunity of cleaning off dusty cars via an express wash or self-serve setting. Due to its advantageous location, getting in and out of the venue is a snap, which endears the locale to drivers who dislike the tedious aspects of navigating oncoming traffic when trying to exit other car washes. A large pylon with a double-sided cabinet sign directs drivers to the company’s location. Marketing Professionals: Need New Ideas for you Clients? Subscribe to our Projects Blog!